The carving on Stone Mountain is the largest relief carving in the world. It measures 90 feet tall by 190 feet wide, or 17,100 square feet. At its deepest, the relief is carved 42 feet into the rock face. 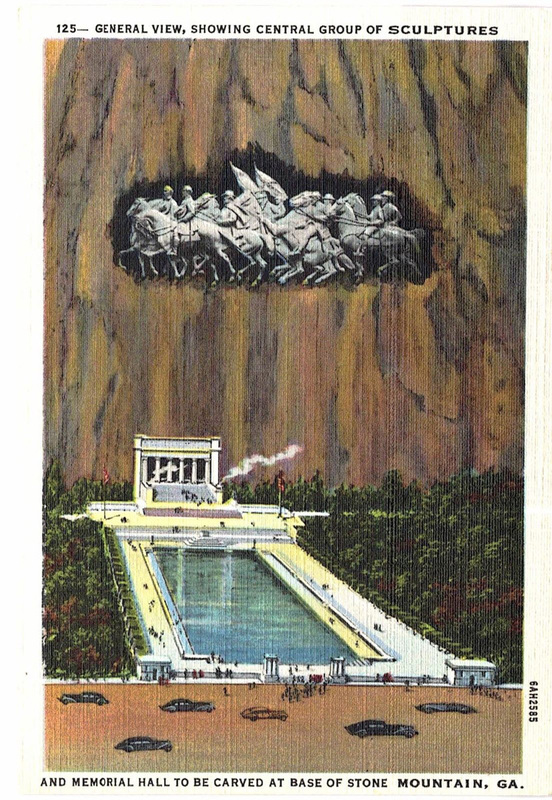 Gutzon Borglum, who went on to carve Mount Rushmore, had grandiose designs for more than the carving and envisioned a complex that included a memorial hall and reflecting pond leading up to the carving. This is not too different from his plans at Mount Rushmore which also had to be scaled back. He expected to carve the memorial hall into the mountain, and he had similar plans at Mount Rushmore. At Mount Rushmore he planned to house the Declaration of Independence and the Constitution. Three figures on horseback featuring Jefferson Finis Davis, Robert Edward Lee, and Thomas Jonathan "Stonewall" Jackson make up the entirety of the sculpture. This is greatly reduced in size and complexity from the original concept by Gutzon Borglum. But after three attempts it is what was achievable balancing time, money, and effort. Any student of the Civil War knows who these three men were, but few know of their government positions prior to the beginning of the war in 1861. All three graduated from West Point and served in the army during the Mexican-American War. Davis, who is less often studied, also served in Congress and as Secretary of War, and married the daughter of President Zachery Taylor who was his commanding officer during the war with Mexico. One interesting side note between the coin and the carving are the noticeable differences. On the completed carving the three riders have their hats covering their hearts, whereas on the coin Lee is wearing his hat. On the coin Jackson and Lee are in the lead with Davis completely out of the picture. These differences exist because of timing. The coin was struck to help raise money for the project and done early in the project when Borglum was still involved. His design made it to the coin and early items of exonumia, but not completely to the mountain. Gutzon Borglum was the first to attempt the carving and had the most expansive plans of the three primary carvers. We know from his later work on Mount Rushmore that he dreamed big, often beyond his ability to fund or execute his original designs. He estimated the work would take a decade and cost $3,500,000. The UDC through the Stone Mountain Confederate Monumental Association (SMCMA) acquired access to the property in 1916 but with a twelve year deadline to complete the memorial. But before anyone could really get started all work was interrupted by World War I. Carving was resumed in 1923 but personality differences between Borglum and the officers of the (SMCMA) led to his departure in 1925 with only the head of General Lee close to completion. To raise money for the project Borglum, the SMCMA, and several Congressmen arranged to have a commemorative coin issued. The bill authorizing the coin passed on March 17, 1924, but it did not pass Congress without controversy. Borglum's original coin design shows a part of the compromise in his wording honoring President Harding. Congress authorized the coining of 5,000,000 half dollars, all to be sold to the SMCMA for face value. The SMCMA was to then re-market the coins for $1.00 to provide funding for the project. If the coins had sold, and Borglum's cost estimate held then this might just have funded the major portion of the work. But Borglum's cost estimate was nowhere near accurate and in spite of all efforts the coin sales fell far short of expectations. After Borglum's departure the SMCMA hired award winning sculptor Augustus Lukeman to attempt to finish the carving. The SMCMA had an agreement with the property owners that the mountain would revert to their ownership in 1928 if not completed. Lukeman's job was likely impossible, but he did make several major improvements. First he blasted Borglum's work from the mountain and gave himself a clean palate to work with. He redesigned the sculpture to be more of an attainable project. Although he made significant progress on the sculpture, completing it in time was an impossible task and the property reverted to the original owners in 1928, and there it languished until 1964. If you look closely at the photo on the right, the heads of Lee and Jackson from the first carving are faintly visible above the new carving. If it were not for the Crazy Horse Memorial we might think that no project of this size can be undertaken without government intervention. But the Crazy Horse Memorial has several advantages that the Stone Mountain carving lacked. Having a single family in charge eliminated a lot of infighting and gives that project continuity that the Stone Mountain carving lacked. While the Crazy Horse Memorial will take almost 100 years to complete, it will also be the world's largest carving upon completion. But we did need government intervention to complete the Stone Mountain carving and it came from the State of Georgia. In 1958 the State purchased the mountain and 3,200 accompanying acres to create a large state park. The State took control of the carving and brought in Walker Hancock in 1963 to manage the project. Hancock's partnership with Roy Faulkner proved to be the magic formula and the carving was completed in 1970. Faulkner carved with a torch and was personally removing as much material each day as as forty or fifty men could remove in a week using previous techniques. His skill at interpreting the size of the memorial to the mountain was the ultimate key to success.